In "Young Goodman Brown," one of Hawthorne's most admired and critically discussed stories, he probes the psychology of Puritan Salem's witchcraft frenzy to offer insights into the moral complexity of human nature. A dark, penetrating tale, as "deep as Dante," according to Herman Melville, "Young Goodman Brown" reveals Hawthorne at his best--skillful writer of symbolic allegory and astute interpreter of Puritan history. In seventeenth-century New England, most people shared a strong belief in witchcraft, and in the "Wonders of the Invisible World," Cotton Mather recorded the hellish workings of witches and the Devil against the Puritan experiment. The origins of the belief in witchcraft and "specters" went back to Europe, where, by some estimates, five hundred thousand people were executed for witchcraft between the fifteenth and seventeenth centuries. Prior to the Salem outbreak of 1692, almost three hundred people had been accused of witchcraft in New England; more than thirty had been hanged ("witches" were not burned in England or the American colonies). The flair up of accusations in 1692, beginning at Salem Village (now Danvers) , spread to many other communities in Essex County, Massachusetts and was the worst and most dramatic episode of witch hunting in colonial America. When it was over, twenty people had been executed-nineteen hanged and one, Giles Corey, pressed to death. More than a hundred people had been jailed, and several died during their imprisonment. Both men and women were accused, imprisoned, and executed for witchcraft prior to and during the Salem hysteria. 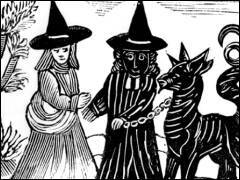 In colonial New England, however, almost all accused "witches" were older women, who tended to be independent and nonconfomist. An interesting study from this perspective is Carol F. Karlsen's The Devil in the Shape of a Woman (W.W. Norton, 1987). Generally, historians have seen the Salem witchcraft hysteria as significant because it was the last time in American history that accusations of witchcraft would lead to execution. The episode and its aftermath also marked the end of Puritan authority in New England and, with dawning rationalism, the belief in devils striking out from some "invisible world."